If you were wondering whether the auto industry was giving up on cars and only relying on SUVs to attract new business, look no further than the thoroughly reinvigorated Volvo brand and its wonderfully renewed lineup of sport wagons and crossover-styled variations on the same five-door theme. The first pair to arrive was the elegant V90 and V90 Cross Country, both having respectively replaced the old V70 and XC70 for the 2017 model year, albeit the former hasn’t been with us for a decade or so. 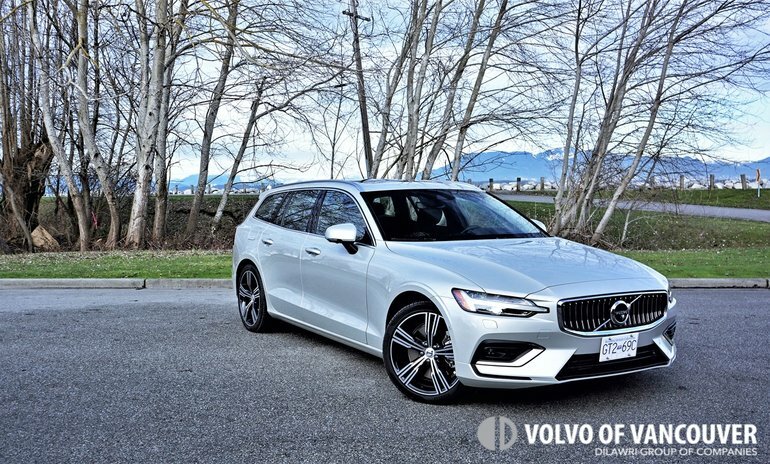 Fast forward to 2019 and Volvo’s wagon lineup just expanded with all-new 2019 V60 and V60 Cross Country crossover models, and thanks to the Swedish luxury brand’s Canadian PR team leaving the sportier of the two in my driveway for three weeks last month, the first review of these two will be closer to the ground. I suppose referencing the more conventional V60 as sportier may not sit well with those who consider a trip down a gravel road with a kayak strapped to the top of the V60 Cross Country T5 AWD a more sport-oriented exercise than fast-tracking through a curving two-lane highway at the wheel of our V60 T6 AWD Inscription, not that the former car can’t manage the latter activity quite well, or vise versa. It’s just that the regular V60 is quicker when upgraded with its as-tested turbocharged and supercharged 2.0-litre four-cylinder engine, and as noted a moment ago sits a bit lower to the ground for better pavement-hugging handling, whereas the raised ride height of the Cross Country allows for greater ground clearance when traversing less hospitable backwater roads and trails. Either way, Volvo has you covered. This is as good a time as any to talk powertrains, being that both V60 models incorporate Volvo’s innovative 2.0-litre four-cylinder engine, the T5 featuring turbocharging and the T6 adding the just-noted supercharger to the mix. The former makes a laudable 258 horsepower and 250 lb-ft of torque for thoroughly enjoyable performance from standstill up to highway speeds and beyond via eight quick-shifting automatic gears and standard all-wheel drive, whereas the latter puts 316 horsepower and 295 lb-ft of torque down to the road via the same all-wheel drivetrain. This allows for an energetic zero to 100km/h sprint of 6.6 seconds and a top speed of 225 km/h for the V60 T5 AWD, while the T6 AWD cuts standstill acceleration runs down to 5.7 seconds while upping maximum velocity to 249 km/h. Volvo’s T6 engine makes a sportier note at full throttle than I last remember, while the zero-to-100 times just quoted feel as good by the seat of the pants as they appear on paper. The drivetrain is especially engaging when set to Dynamic sport mode via the jeweled switch on the lower console, which heightens the performance of all controls. Bend it into a sharp, fast-pace curve and the V60 immediately takes on the role of unflappable sport wagon, providing an adept level of poise that almost seems too capable when simultaneously taking in its resplendent Inscription-trimmed accoutrements. The V60’s cabin is absolutely stunning, which caused me to leave the drive mode selector in Comfort more often than not, and Eco when I was paying attention, which together with auto engine start/stop provided best-possible fuel economy at a claimed 10.9 L/100km city, 7.7 highway and 9.5 combined with the as-tested T6 AWD, or alternatively 10.2, 6.8 and 8.7 for the less potent T5 FWD, and made the most of the impressively smooth ride and wonderfully quiet cabin, ideal for such luxurious surroundings. As Volvo already executed to near perfection in the crossover SUV classes, the premium brand once again creates the D-segment leader for interior design and execution thanks to the highest grades of materials and the finest attention to detail. From its myriad soft-touch surfaces above the waistline and below, including plush perforated leathers, to its beautifully executed decorative metal accents and matte hardwood inlays, the V60 Inscription provides a richness and elegance that’s been sorely missing from this more compact five-door luxury category. Then there’s comfort, which has always been Volvo’s strength. The Inscription seats are superb, and that’s even before making the myriad adjustments they allow for. The seat squabs extend forward, cupping below each knee, while the backrest side bolsters power inward or outward to fit most any body type, whether you want a snuggly hug or more relaxing support. Support in mind, four-way powered lumbar means you can position extra lower back pressure just about anywhere you want it, but surprisingly not all models the V60 competes against offer four-way powered lumbar. Driver setup in mind, the V60’s tilt and telescopic steering column offers ample rake and reach for all bodily forms, my long-legged, short-torso five-foot-eight medium-build frame fully capable of clasping the leather-wrapped steering wheel rim with elbows optimally bent while my legs were easily within reach yet not too crowded by pedals, while plenty of small adjustments remained for tweaking during long road trips. Looking forward, the gauge cluster is digital, which is nothing new for the V60 that along with its S60 sibling was one of the first cars in its class to offer a colour TFT display in place of the usual analogue primary instruments. Still, this 12.3-inch driver display, upsized from the base Momentum trim’s 8.0-inch unit, is a much more advanced bit of kit than the old V60’s. In fact, it takes up all available space below the instrument hood, and even better it defaults to the navigation system’s colour map that features 3D building block graphics that are fabulous fun to watch when tooling around amongst Downtown Vancouver’s high-rises. That map can be shown over on the V60’s standard 9.0-inch vertical centre touchscreen, of course, Volvo’s Sensus interface continuing to be one of the best in the industry. It’s more tablet-like than any of its rivals and therefore is easier to figure out, while featuring Apple CarPlay and Android Auto smartphone integration, plus all of the usual gesture controls, and responds 50 percent faster than earlier versions. Other infotainment features include an excellent split-screen 360-degree surround parking camera, wonderful satellite radio colour album cover graphics, and thanks to an upgrade to the optional $3,750 19-speaker 1,400-watt Bowers & Wilkins audio system, sensational sound quality. Incidentally, that B&W stereo does more than just sound good, it improves the interior design thanks to a lovely little tweeter at dash central, featuring a stylish aluminum grille, while the similarly drilled aluminum door speakers let you see through to coloured cones within. Those speaker grilles are surrounded by some of the only hard composite in the entire car, the rest of each door panel soft touch synthetic from top to bottom, excepting the armrest that’s covered in contrast-stitched leather. Likewise for the centre armrest/bin lid, the front edge of the dash top, and the instrument panel just below. Even better, Volvo finishes the top of the lower console off with a beautiful set of satin-silver framed matte hardwood scroll-top lids for the connectors, tray and cupholders below. Volvo chose not to add the same wood to the doors, but surrounding the steering column and just ahead of the front passenger are lovely sculpted sections next to an equally artistic inlay of flowing satin-silver aluminum, the V60’s interior design coming across much more zen-like than anything from Japan, or Germany for that matter. I could continue on about cabin styling, the volume dial, vent controls, rotating ignition switch and cylindrical drive mode selector rimmed in a grippy diamond-patterned bright metal that sparkles as jewel-like as in any Bentley, while those aforementioned seats are as eye-arresting as sore back-alleviating, but there are still some as yet unmentioned details to cover. For starters, the V60 is spacious. In fact, I think the new V60 is targeting previous V70 customers just as much as those who loved the outgoing V60, thanks to 124 millimetres more length overall, plus a 9.6-mm longer wheelbase that results in the most spacious rear seating area in the luxury D-segment. The new model is 51 mm lower than its predecessor too, which adds to its long, sleek visual stance, but it nevertheless provides ample headroom and legroom for a six-foot passenger behind a six-foot driver. Additionally, the new V60 boasts 20 percent more cargo space than the outgoing car. I’ve commented on features throughout this review, but haven’t yet gone into trim details, so without further adieu the base 2019 V60 Momentum T5 FWD starts at just $43,900, which is only $50 above than last year’s base V60 yet includes standard LED headlamps, rain-sensing wipers, a powered panoramic glass sunroof, dual-zone auto climate control, leather upholstery, power-adjustable heated front seats with driver’s memory, a powered liftgate, power-folding rear seat headrests, power-folding rear seatbacks with controls in the cargo compartment, a semi-automatic cargo cover that conveniently slides up and out of the way when opening the tailgate, and much more. This being a Volvo plenty of safety gear comes standard too, including standard City Safety automatic front collision warning with full low- and high-speed autonomous emergency braking, plus Driver Alert Control, steering support, Run-Off Road Mitigation, Lane Keeping Aid and Oncoming Lane Mitigation, and more. Of note, the V60 introduces new Oncoming Braking that, if sensing an imminent head-on collision will automatically actuate maximum braking force two-tenths of a second before impact. This reduces vehicle speed by 10 km/h before impact, which could potentially save lives and would certainly minimize injury. 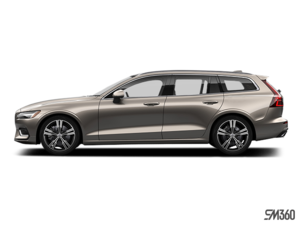 I won’t go into all standard and optional features available with Momentum or my $55,400 tester’s Inscription trim, but if interested feel free to check out my 2019 Volvo V60 Overview that covered everything in detail, so suffice to say the Inscription gets a special chromed waterfall grille, cornering headlights, fog lamps, a really nice leather-wrapped and metal edged key fob, Power Steering Personal Settings with low, medium or high assistance, the gorgeous Driftwood decor inlays, digital gauge cluster and four-way powered lumbar noted earlier, Nappa leather upholstery that’s perforated for allowing through forced ventilation up front, plus plenty more. Option out a V60 Inscription and you can have the same $1,000 19-inch multi-spoke alloys as seen on my test car, the previously noted audio upgrade, $1,300 massaging front seats and a $1,150 graphical head-up display. Additionally, my tester included a $1,250 Climate Package with heated Aquablades windshield wipers, a much-welcome heatable steering wheel, and heated rear seats; a $1,500 Convenience Package with Volvo’s Pilot Assist semi-autonomous drive system that uses the Adaptive Cruise Control, Lane Keeping Aid and other advanced driver assistance features to keep the V60 within its chosen lane, plus a Homelink garage door opener and a compass; plus an $1,800 Vision Package with the aforementioned 360-degree surround parking camera, Park Assist Pilot semi-autonomous self parking, front parking sensors, auto-dimming side mirrors, and blindspot monitoring with rear cross traffic alert. Lastly, the only V60 attribute that arguably outshines all of the above is exterior styling, which, in my opinion, makes it the most attractive sport wagon in the compact luxury D-segment, and possibly the best-looking combination of new Volvo design elements to date. I love the shape of the new grille and the way the headlamps flow rearward over the front fenders, not to mention the motorsport-inspired wing strut design of the lower front fascia, but most of all I like this wagon’s wind-cheating high-roof profile, culminating at two of the most unorthodox taillights on today’s market, the V60’s sharply cut L-shaped lenses paying obvious tribute to Volvo’s recent past, but all-new and totally unique too. It shouldn’t be difficult to tell that I’m in love with the new 2019 V60’s design, and I must admit to liking everything else about it too. It helped to make my most recent holiday season especially enjoyable and remained to ring in the first week of 2019 with style, comfort, great performance and all-round class. I can’t help but recommend it highly.